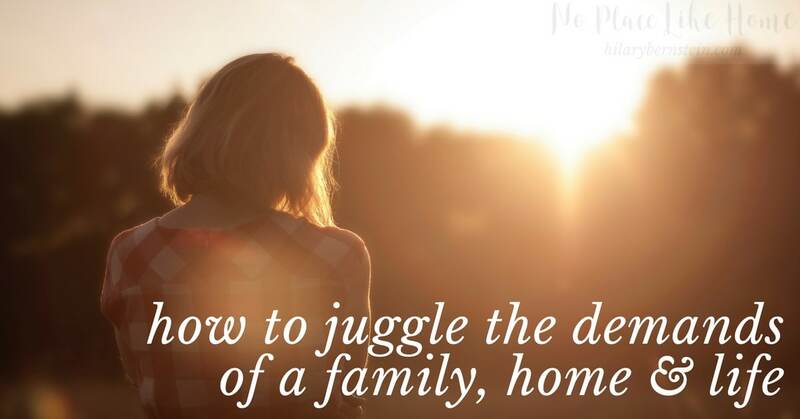 How is it possible to juggle the demands of a family, home and life? Here are six ways to help you balance everything. These real-life confessions all have come from my e-mail subscribers. Their biggest homemaking frustrations and concerns mirror my own. Because most days I’m asking myself how in the world I can juggle the demands of everyday life, along with my husband and children and our home, not to mention taking any time for myself. 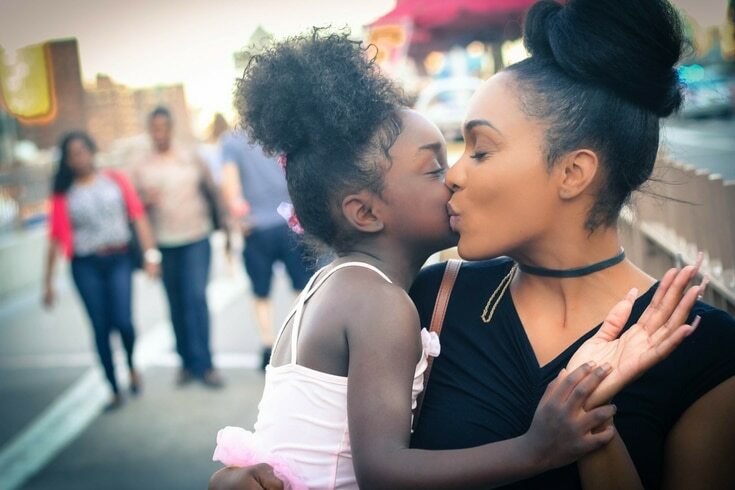 As wives and mothers in search of finding some sort of balance in life, how can we ever juggle the demands of a family, home and life? Is it time to examine our expectations? If we look at our family/home/life balance, it’s completely unrealistic to expect ourselves to do everything amazingly all the time. As much as you want to, you can’t possibly live as a rock star wife and mom and housekeeper and employee and friend every single day. With the enormity of responsibilities (and blessings) that come with each of those roles, you can’t possibly expect to excel at all of them at the same time. I truly believe we’ll never find balance in the sense that we have all our ducks in a row all the time. During certain seasons of life, there’s chaos. When people and responsibilities are added to your life, you’ll naturally have more to do and less time to do it all. It’s not really a motivation issue. It’s part of life. Since we can’t do it all, it’s unfair to ourselves to put a burden of guilt on that we should do it all. Yet in the midst of recognizing that we can’t do it all, we still have our roles and responsibilities. Just because we feel a little overwhelmed at times, it doesn’t mean our commitments just disappear. No, the key is finding a way to juggle the demands that are a part of marriage and parenting and cleaning. So how can a homemaker manage her time and balance husband and children and cleaning? How can you have time and energy to get housekeeping done each week when you have children in your home or are working a full-time job? To avoid absolute frustration with imbalance, I’ve found that giving myself grace and lowering my standards – in a good way – is essential. Once I realized I simply can’t do it all, I stopped feeling bad about not doing it all. When rooms or closets are messy, when I can’t touch my laundry pile for a couple days, when my garden gets weedy I choose not to get frustrated but to go with the flow. Sometimes this is a huge choice. Like when I see dust bunnies multiplying under my bed. Or I discover the baby books that need filled in before I completely forget my children’s births, infancies and early childhoods. And typically, it’s a daily choice to stop feeling bad when I can’t do absolutely everything. When I look around and see a messy house and know everything that I still really need to do in a day, I feel so overwhelmed. So I remind myself it’s absolutely impossible to get everything finished, let alone get ahead. But then I stop myself and make an effort to choose to not be frustrated. Sometimes you do clean just enough to get by … and eat store-bought frozen meatballs so there’s a hot meal on the table. 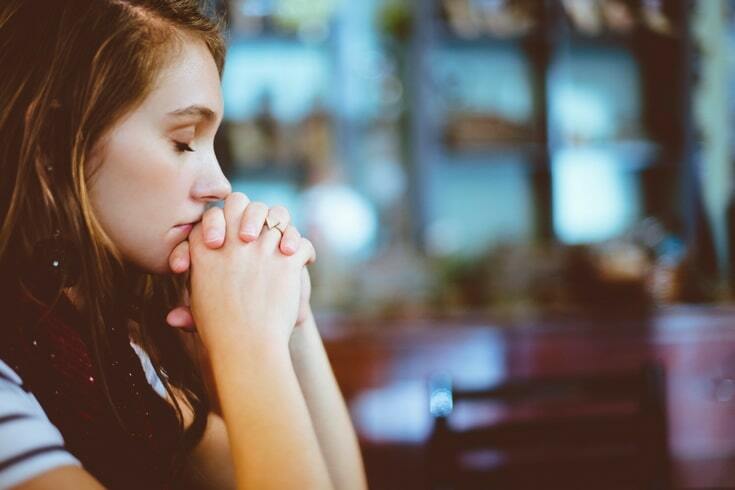 As you’re struggling with finding balance and mulling over how to care for the priorities you do have, pray for guidance. Pray for wisdom and discernment. Pray for a clarity of thought. As you’re praying, surrender your life, your will, and your plans to the Lord. As you do this, He’ll make something beautiful out of your life. It may not be a tidy, packaged answered prayer; in fact, it could be (really) messy at times. But He makes everything beautiful in its time (Ecclesiastes 3:11). When my house is particularly messy, I start to panic in an “I can’t think straight!! !” sort of way. So I try to stop everything and do a 10-minute Room Rescue. I set a timer, then start cleaning as much as I can. Typically I stick to one room at a time and speed clean. When the timer’s over, so is my cleaning. My entire house may not get clean during a Room Rescue, but a room – or even just an area of a room – is clean and that is a tremendous help. Sometimes, you have to force yourself to stop and have fun. Leave the dirty dishes in the sink and play a board game with your husband and kids. Head to the park for a half an hour before supper. Read a funny book as a family. (Roald Dahl’s books make my kids howl with laughter.) Have a movie night with popcorn – and just sit and watch the movie without doing any other work. Make yourself take a half an hour break to do your favorite craft or hobby. It may actually feel hard to get away from your mental to-do list, but you need to relax and decompress. And the time spent doing something fun with your family will be refreshing for all of you. It will be hard, but look at your schedule … and how much time you spend checking Facebook or Pinterest. (Ouch!) What commitments are necessities, and what can be cut out of your life? Get rid of what’s not essential, and you’ll end up making more time for your tasks and your family. Not many people like asking for help, but it’s essential. Admit when you’re in way over your head, and ask for help from someone you trust. Besides my Room Rescues when my house is a mess, my solution for when my schedule is a mess is to make a plan. I write every single thing I need to do on a piece of paper. Once it’s out of my thoughts and I can actually look at everything, then I try to figure out when I can do it all. I try to break everything into manageable tasks so I can actually start to work toward some completion. But, just because I’ve made a to-do list, I am careful to not turn it into the almighty to-do list that runs my days. Instead of finding my satisfaction (and even, to a large extent, my self-worth) in finished to-do lists, I’m trying to adjust my expectations. Now I try to feel satisfied when I finish what needs to be done instead of attempting everything I’d like to get done. I’d like to believe if I could just manage my time a little better I could accomplish so much more. But realistically I can’t. And the truth is, life is so much more than accomplishments. When I know that there’s too much home/family/life/work for me to balance, I admit that I need to juggle it all. When it comes to juggling, you need to keep your focus. Realize that you need to have some balls (or tasks) in the air – you can’t hold on to everything with a death grip all the time. So go with the flow. When juggling life, some days you’ll need to spend more time with your children. Other days, your husband will need your full attention. During times of the day, you can focus on taking care of your home … or working on finances, or simply working if you have a job. You don’t have to give the same amount of time and attention to each part of your life every single day. You can’t. But you can give your best time and attention to certain parts each day, as you learn to juggle life. As you do this, you won’t have to wonder how to find some sort of balance in life. 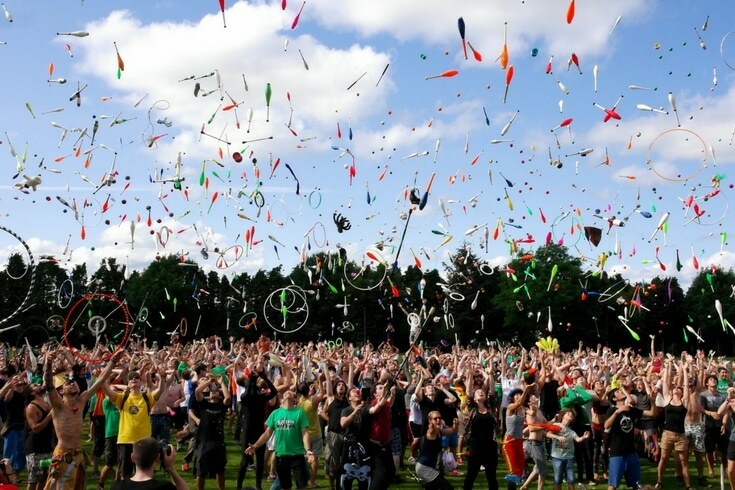 You’ll practice actually juggling it all. 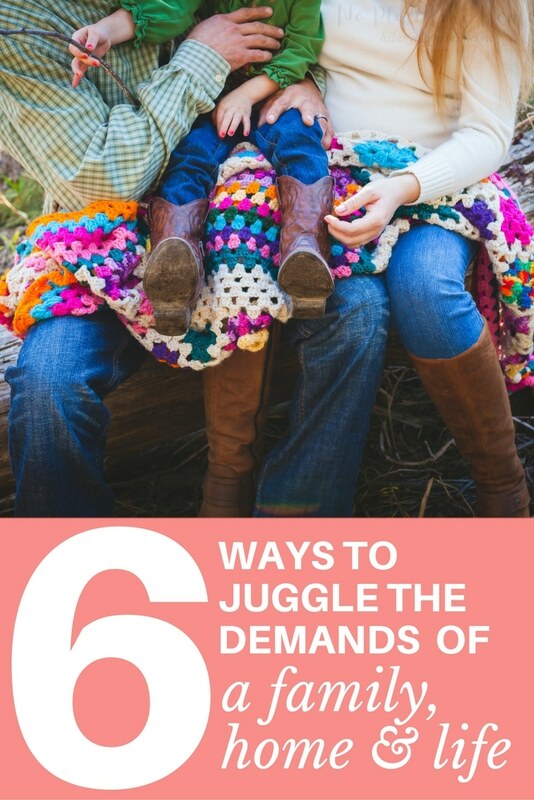 How do you manage to juggle the demands of your family, home and life? What works best for you? Find out how to find balance in your life – and homemaking! – with the Balance in Homemaking Conference.Twenty sessions with Titus 2 mentors are available for instant download … and instant inspiration and help! Disclosure: This post originally was published on Sept. 23, 2015. Purchasing items through links in this post will result in a commission for No Place Like Home. Thank you for supporting this website! « What Stands In The Way Of Your Motivation to Clean? Thank you so much for this blog. I has really helped me out.